Click On The Link Below For The Latest Information. 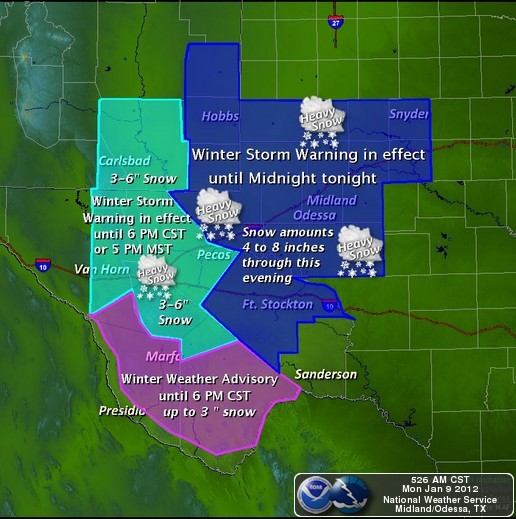 Quote NWS Midland..."Powerful Winter Storm to Impact West Texas and Southeastern New Mexico... For road conditions in Texas, please call 1 (800) 452-9292. For New Mexico road conditions, please call 1 (800) 432-4269. 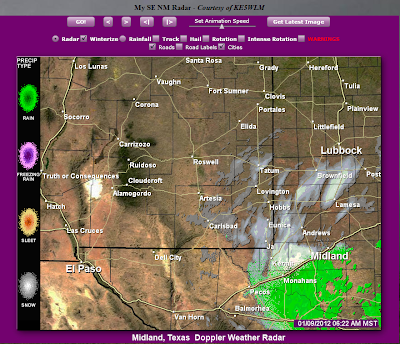 Heavy snow will develop over the Guadalupe and Davis Mountains and spread across the Permian Basin of west Texas today. 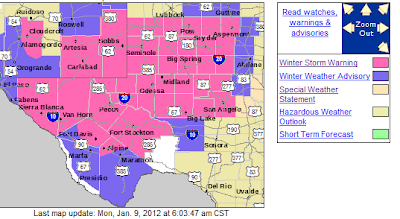 A Winter Storm Warning is in effect through this evening for much of west Texas and southeastern New Mexico. National Weather Service personnel are working around the clock to monitor this developing winter storm. Additional statements will be issued Sunday night into Monday as conditions warrant. Please stay tuned to NOAA Weather Radio, your local television or radio stations, or your satellite or cable television provider for the latest information regarding this unfolding winter weather event. You can also get the latest in weather information 24 hours a day, 7 days a week on the internet at www.weather.gov/midland. Significant snowfall will develop across west Texas and southeastern New Mexico today and this evening. The snow will end from west to east tonight. Total snowfall accumulations of four to eight inches are likely over the northern two thirds of the Permian Basin with three to six inches of snow likely today over the Guadalupe and Davis Mountains and the Trans Pecos region. 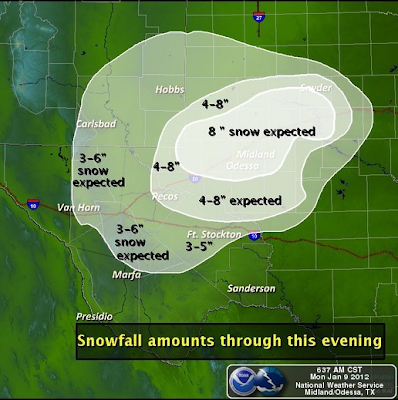 Over the Big Bend of west Texas, snow accumulations of one to three inches are possible. A Winter Weather Advisory is in effect for this area until 6 pm CST this evening. Heavy wet snowfall may accumulate on power lines and limbs of nearby trees, possibly causing scattered power outages. Additionally, snow loading on large roofs, such as can be found on warehouses and large retail stores, could result in structural failure." Continues In Effect Until 11 PM MST Tonight. Widespread Moderate To Heavy Snowfall. Widespread 3" - 6" Eddy County. Widespread 4" - 8" Lea & Culberson Co's. Localized 10+" Possible, Especially Near Mtn's. In Convective Snow Bands/Thunder Snow. NE Winds 20 MPH With Higher Gusts. May Cause Scattered Power Outages. Low Visibilities Due To Heavy Snowfall. Dangerous To Impossible Driving Conditions. Valid Through 6 PM MST. Generally 1" - 2" Snowfall Southeast Chaves Co.
Remains In Effect Until 11 AM MST This Morning. Generally 4" - 8" Snowfall Totals. Locally Heavier Totals Higher Slopes. NE Winds 10 - 20 MPH. Slow Moving Powerful Winter Storm! 09Z/2 AM MST RUC 500 MB Analysis. Early this morning the center of the powerful closed upper-level low was located just south of the New Mexico Bootheel in Northern Mexico. This potent Winter Storm is forecast to crawl slowly eastward today and tonight. 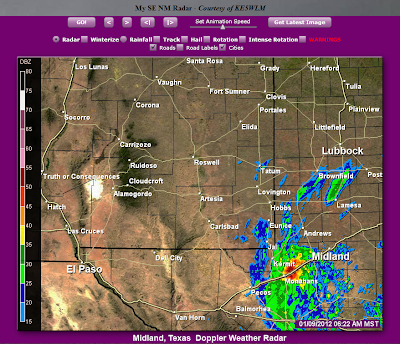 Currently it is forecast to be located south of Midland, TX by around sunset today. It should be noted that any subtle shift in the storms track will have huge impacts upon our local weather today, and tonight here in southeastern New Mexico and West Texas. If this storm shifts a little further to the south than the models are currently forecasting, then we will see less snowfall than is being forecast here in Eddy and Lea Counties. A further shift to the south with the storm track would shift the heaviest snowfall south and east of us. If this storm wobbles just a tad further north than is currently being forecast, then Eddy and Lea Counties, and perhaps southern Chaves County, would see heavier snowfall totals than is being forecast for today. These types of storms are very tricky to forecast. A shift in the track of the storm to the north or south, with as little as 25-100 miles, can make all the difference in the world in who gets hammered with heavy snowfall and who does not. Current thinking from the National Weather Service Forecasters is that widespread snowfall totals of 3" - 6" will occur across Eddy County. Widespread snowfall totals of 4" - 8" will be possible across Lea County. Some parts of the local area may see lesser amounts, generally in the 3" - 6" range. Some areas, especially near the mountains may see more. Locally 10+" may easily fall in a few spots, especially with any thunder snow that develops, and across the Guadalupe Mountains. Interestingly enough some of the models are forecasting storm total snowfall amounts of 10" - 15" across parts of the area. Snowfall rates of 2" an hour or greater will be possible today with the convective snow bands and any thunderstorm that develops. the Midland/Odessa area, near Monahans at 6:22 AM MST. This appears to be one of those convective bands forming. Same Image As Above But In The "Winterize Mode". SE NM While Moving Westward. My Web Page, And Be Sure To Check The "Winterize"
Button To View Local Radars In The Winter Mode. 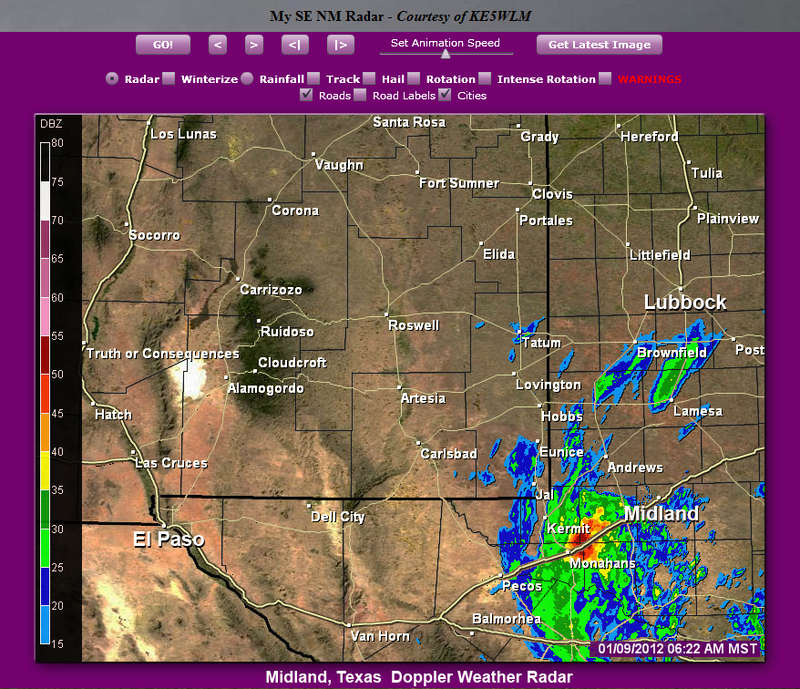 It appears that parts of southeastern New Mexico and West Texas are going to get dumped on by this storm. The problem today will be in trying to figure out just exactly where the upper-level storm tracks, and where those convective snow bands set up. I think that this is going to be one of those storms that either misses most of southeastern New Mexico, and hammers West Texas, or surprises a lot of people in here in southeastern New Mexico. Heavy wet snow is forecast and this may cause some travel problems over the area, so please be aware of this if you have travel plans across SE NM or W TX today into tomorrow morning. Though I disregard the usual hype of much snow in Abq, it was less than even I figured. Just spits of wet snow and mist all afternoon here, as the sun shone and strong E winds! You would never know your weather is forming by the sun here in Abq. Hope you get plenty of precip, but safe travelling in spite. Thanks David...sorry you missed out this time. 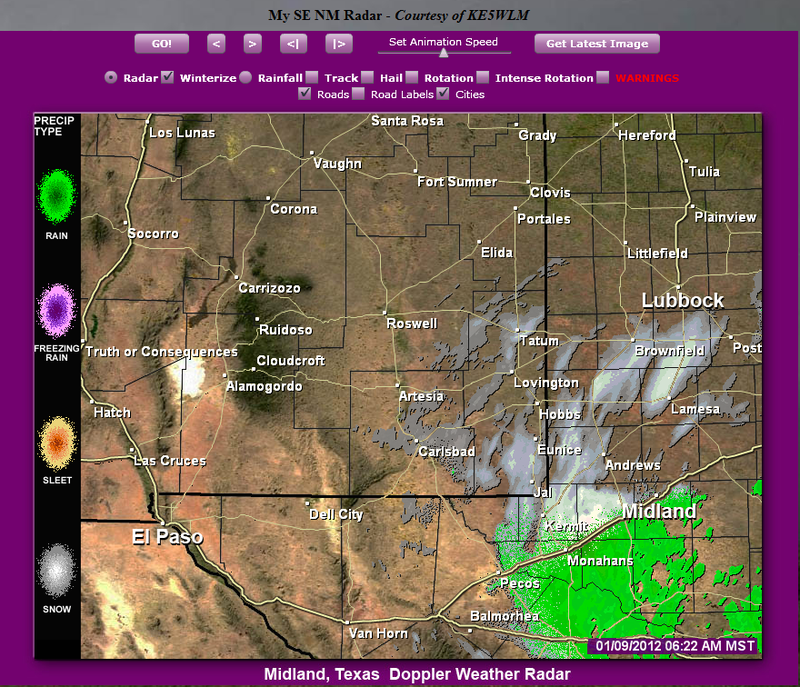 Midland/Odessa have already picked up 3" and its snowing at the rate of 1.2" an hour there now. Big flakes coming down in Carlsbad off and on this morning. Some accumulation on the grass in places but a lot of melting. Snow starting to stick in Artesia at 10 AM.